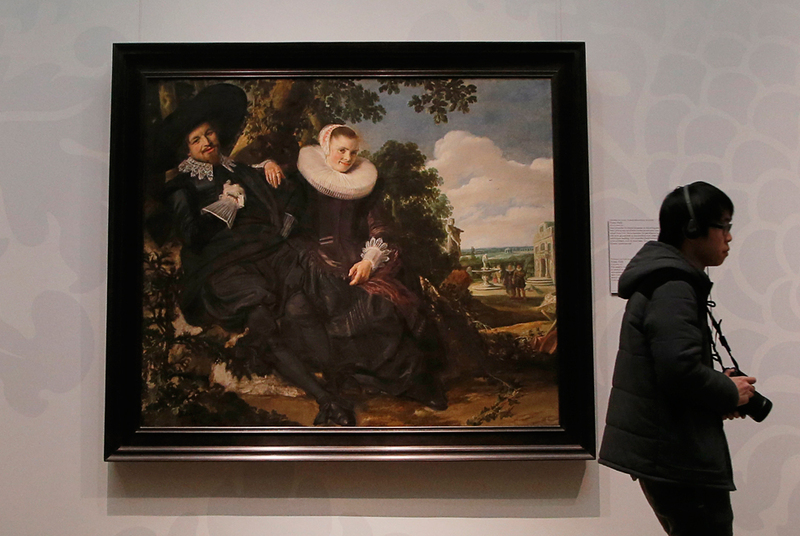 A man walks by artwork at the Rijks Museum in Amsterdam on December 21, 2012. AFP PHOTO / ALEXANDER KLEIN. AMSTERDAM.- The most important museum opening in 2013 is the Grand Opening of the Rijksmuseum in Amsterdam on 13 April after a 10 year closure. The renovation, which has completely transformed and renewed the historic building, is one of the most significant ever undertaken by a museum. The re-opening provides an opportunity for a major representation of the museums world-famous collection, much of which has not been accessible to the public for a decade. Over 8,000 works of art will go on show telling the story of Dutch art and history, with masterpieces by artists including Frans Hals, Jan Steen, Johannes Vermeer and Rembrandt van Rijn. On a much smaller scale, the Ditchling Museum, which tells the story of a remarkable village and its community of 20th century artists and craftsmen, will open in Spring 2013. The museum has a unique collection of work by Eric Gill, Edward Johnson and others who came to Ditchling to live and work. London will see the opening of a new not-for-profit art space, The Dairy, launched by leading collectors, Frank Cohen and Nicolai Frahm in Spring 2013. The 12,500 sq ft warehouse was the former milk depot for Express Dairies, and its unique,raw, industrial spaces with high ceilings and skylights will provide exceptional exhibition space for art. The programme will include curated exhibitions drawing on Frank Cohen and Nicolai Frahms collections, as well as incorporating loans from galleries, artists and international collectors. In Britain the most important opening in May 2013 will be Tate Britains newly refurbished galleries with a major new chronological hang of the Collection, the most important holding of British art in the world. This will be followed in October 2013 by the completion and opening of the new building development at Tate Britain. The project opens up the new entrance and lower floors as well as three floors of the stunning domed atrium at the heart of the gallery creating much-needed learning studios and public spaces in order to meet growing demand. In the summer, the Serpentine will open its new space, the Serpentine Sackler Gallery with an exciting programme showcasing the latest exhibitions and commissions. Situated a stones throw from the Serpentine Gallery in Kensington Gardens, the project brings the listed Magazine building into public use for the first time in its 206-year history, providing and new cultural destination and landmark for London. The designer for the project is Pritzker-prize winning architect, Zaha Hadid. At the end of the year, Rem Koolhaass new building for the Garage will open in Gorky Park in Moscow. Garage Gorky Park is located in the Parks famous 1960s Vremena Goda (Four Seasons) restaurant, which has been newly renovated after remaining derelict for more than two decades. The new museum will present a programme of temporary exhibitions, and the building includes exhibition galleries, a creative centre for children, shop, café, auditorium and offices. Also due to open in 2013 is the Aga Khan Museum in Toronto, Canada, dedicated to the acquisition, preservation and display of artefacts and works of art relating to the intellectual, cultural, artistic and religious heritage of Islamic communities. The Museum collection contains over one thousand artefacts and artworks spanning over one thousand years of history, which present an overview of the artistic accomplishments of Muslim civilisations from the Iberian Peninsula to China. Designed by Japanese architect Fumihiko Maki, the museum features galleries, an auditorium, a reference library, multimedia centre, and education spaces situated around a central courtyard. The Barber Institute of Fine Arts in Birmingham marks its 80th anniversary by embarking on a year-long programme of special exhibitions, displays and concerts. The programme opens with an exhibition focusing on the Barbers founder, Portrait of a Lady: The Life and Passions of Lady Barber (to 24 February 2013). In May 2013, the exhibition, About Face: European Old Master Portraits from National Collections (16 May  1 September 2013) will bring to the Barber outstanding portraits from the National Gallery by Rembrandt, Goya and Cézanne, among others, which will be displayed alongside works from the Barber of comparable date and scale, but contrasting style, subject or approach. Also in May, Birth of A Collection: The Barber Institute of Fine Arts and the National Gallery (22 May - 1 September 2013) will see the first 12 paintings acquired for the Barber galleries  including masterpieces by Simone Martini, Cima, Poussin, Turner, Manet and Monet  displayed at the National Gallery in London. In the early new year, a major exhibition focusing on Robert Rauschenbergs Jammers, silk wall and floor works will go on show at Gagosian (February/March 2013). The Jammers cycle originated in 1975 and draws inspiration from the trip Rauschenberg made in May 1975 to the to the textile centre Ahmedabad in India where the locals made their handmade paper. In March, William Turnbull at Chatsworth (10 March  30 June 2013) presents a rare exhibition by one of Britains leading artist following his recent death. The exhibition will present large-scale works as well as paintings and drawings all shown in the spectacular setting of Chatsworth House. Moore Rodin at the Henry Moore Foundation in Perry Green (28 March  28 October 2013) is a once-in-a-lifetime exhibition which presents the work of Henry Moore and Auguste Rodin exhibited together in the rural landscapes of Perry Green where Henry Moore lived and worked. The exhibition will highlight the influence of Rodins work on Moore and draw new parallels between two of the worlds most celebrated sculptors. In April Hans Ulrich-Obrist will curate an exhibition in São Paulo Glass House, the former home of Brazilian modernist architect Lina Bo Bardi. Around 20 international artists and architects have been invited to create special projects in the house. The exhibition is the latest in a series of interventions in artists houses curated by Hans Ulrich Obrist. In April, Rachel Whiteread at Gagosian (April/May 2013) is an exhibition dedicated to the work of one of Britains foremost contemporary artists. Masterpieces from the Hermitage at Houghton (May  September 2013) is a unique exhibition in which masterpieces from the State HermitageMuseum in St Petersburg will be brought back to their original home at Houghton, one of Britains finest Palladian houses. The collection was originally brought together by Britains first prime minister, Robert Walpole (1676-1745), and sold to Catherine the Great, Empress of Russia, in 1779. The paintings have not been seen in Britain for over 230 years, and they will be shown in their original settings at Houghton, the Walpole ancestral home in Norfolk. One of the most famous art collections of eighteenth-century Europe, the exhibition will include masterpieces by Van Dyck, Poussin, Albani, Rubens, Rembrandt, Velazquez, Murillo and several others. Works of art from other public and private collections will also be on show, from institutions including the National Gallery in Washington, the Metropolitan Museum in New York, and several other Russian galleries. One of the highlights of the Venice Biennale at the end of May will be a major retrospective of the work of Anthony Caro at the Museo Correr presented in association with the British Council. The exhibition will provide a unique chance to see works by Britains greatest living sculptor in the historic setting of one of Venices most celebrated museums. Qatar Museums Authority will present the first major retrospective of the work of Damien Hirst in the Middle East in Autumn 2013. The exhibition, curated by Francesco Bonami, will be staged in the spectacular setting of Al Riwaq Doha Exhibition Space. A major new publication will be issued to coincide with the exhibition including essays by leading Arab writers.